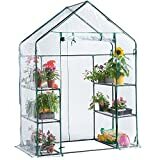 With a greenhouse, you can grow different flowers, vegetables, and herbs when it can’t be grown outside. Growing peppers, tomatoes, lettuce and other vegetables fetch a high price in the market if you grow these when they’re not readily available in the market. 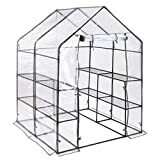 One other advantage of having a greenhouse is that you can maintain your garden when the weather outside isn’t very comfortable and convenient for them to bloom. Ideal for giving seedlings and young plants an early start, plant protection, and ensuring improved growth. Product material: high-quality PVC, corrosion-resistant, and durable. 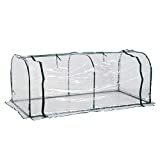 Suitable for flowers, vegetable and fruit planting, protect them from rain, wind, bird damage and strong sunlight. Dark green powder coated 16mm steel tube, hardy and durable. At bottom, there is 10cm redundant cover for that soil can press on it to prevent storm and ensure obturation. Material: high-quality PVC, corrosion-resistant, and durable. 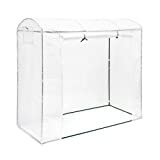 The walk-in greenhouse can keep the heat and prevent the cold so as to protect your plants from cold wind, cold wave and snowstorm, and offer more comfortable environment for them to grow. 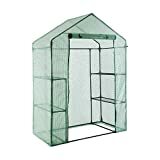 The walk-in green house is easy to move, 100% waterproof, and anti-UV, so that your plant flowers can absorb more sunshine, and enjoy enough room to grow. 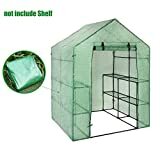 The product is only equipped with the plant cover. The iron frame is not included. Please check your iron frame size before ordering the plant cover. 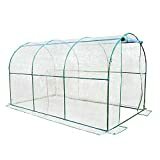 Perfect greenhouse for cultivating and maturing tomatoes, melons, peppers, lettuce, etc. 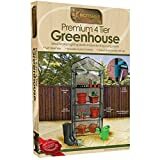 Ideal for growing and displaying plants, seedlings and shrubs. Protecting plants and vegetables from winter chill and spring frosts. 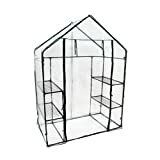 This greenhouse is the perfect item for gardening hobbyists, green fingers or someone who just wants to start his own. Dark green powder coated 19mm steel tube, hardy and durable. You can get away with seasonal changes and it will give you enough flexibility to practice different types of gardening. The installation and setup of greenhouses don’t require much effort and the scope for customization is very high. The size of gardening, the doors and windows in your garden, the storage space, and the placement of plants can be easily customized. It’s much easier than starting a garden from scratch. 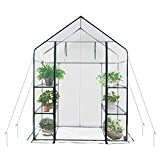 It can be used for different gardening practices as you can mix different varieties of plants, both outdoor and indoor plants, and also vegetables and herbs.